This is a very quick and easy sweet treat that can be whipped up in minutes. For a dairy and gluten-free vegan treat that will be ready in no time, this is one recipe that can’t be missed! Place finely chopped chocolate in a mixing bowl. In a separate bowl, add coconut milk and microwave until very warm but not boiling. trying not to incorporate air. Continue stirring until completely melted, creamy and smooth. Add vanilla time and stir. it comes out mostly clean, it’s ready to scoop. Once chilled and firm, prepare a small dish of cocoa for rolling. 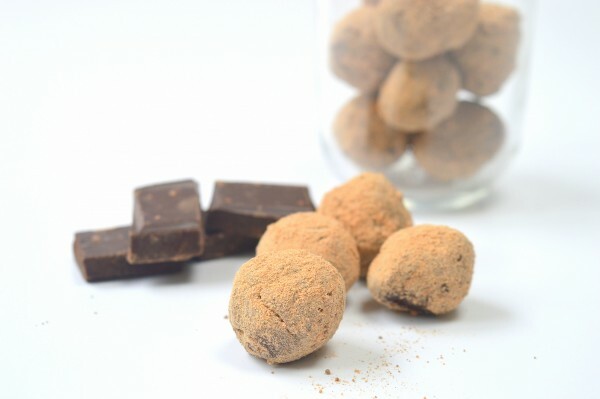 gently but quickly roll/form the chocolate into balls. serving dish. There should be about 16 truffles, depending on the size of your scoop. Thank you to Discount Supplements for providing the ingredients with which to create this recipe.